Stephen Antonakos worked endlessly with neon, collage, sculpture, and drawing to explore the gaps between perceiving and knowing, space and the ways to delineate it. Blue Incomplete Circle on a Blue and Red Wall (1978), one of Stephen Antonakos’s ambient “walls,” was redesigned by the artist in the summer of 2013 to fill the vacant spaces of Industry City and installed just weeks after his death for Surviving Sandy that fall. In addition to the wall, the prescient Last Collage (2002), 50 poetically framed twigs and coins collected over a year of world travels, was hung adjacent from Blue Incomplete Circle across the gallery. Together, they conveyed the exhaustive reflections on space and form found in Antonakos’s work. Stephen Antonakos, “Blue Incomplete Circle on Blue and Red Wall,” 1978. Blue and red paint, blue neon tube, 12 x 18″. Courtesy of Stephen Antonakos Studio. Photo by Brian Buckley. 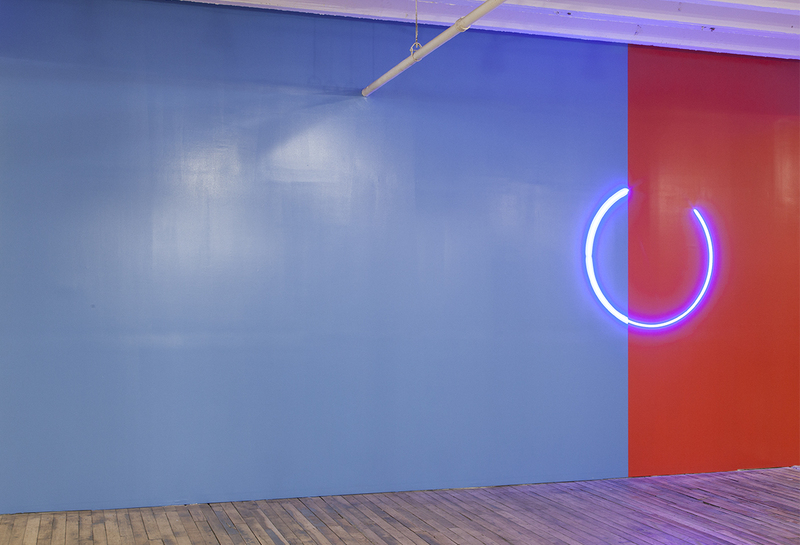 Like much of Antonakos’s work, the use of neon and incomplete geometries in Blue Incomplete Circle on a Blue and Red Wall intuits what we can and cannot know about space. An incomplete circle disorders the provenance of a represented object from a shape or a line. With the circle incomplete, can an object still be suggested through the line, or is the line itself an object? Likewise, what is the suffused blue light that is visible but intangible? It is almost object-like, and yet, how do we identify a shape we have never seen before? Likewise, the rich blocks of red and blue delineate space from left to right, directing the eye to the endpoint of the incomplete circle. The incomplete circle and the light it emits beget certain impossibilities that lie beneath the process of observation. Last Collage responds to similar questions with more tactile objects: found twigs. Like the other works in Antonakos’s prolific series of travel collages, he spontaneously turned found objects—in this case twigs and coins—into abstract gestures to memorialize and individualize a perfectly banal, anonymous moment. 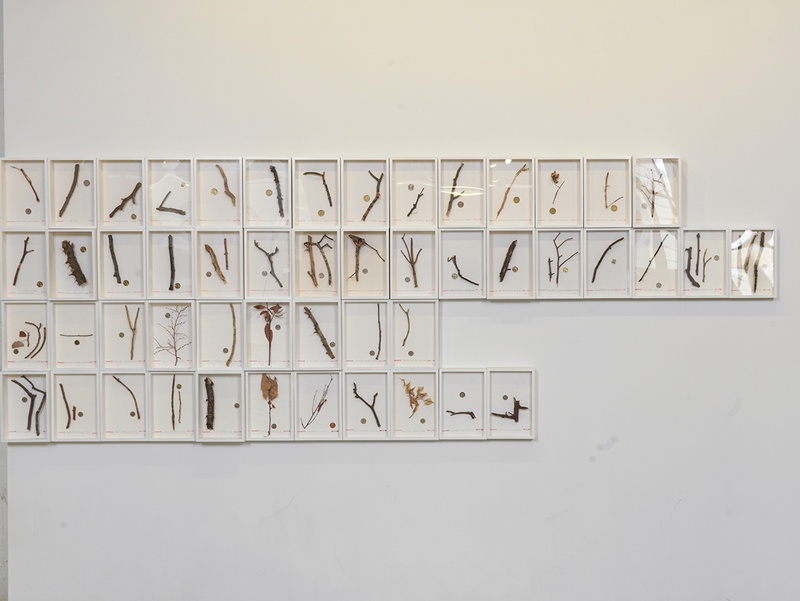 The twigs in Last Collage are ostensibly relics of a specific time and place, identified by the small handwriting in the bottom of each box. All together, however, they employ the same idea of incomplete geometries found in Blue Incomplete Circle, this time shown with objects isolated from nature. The line of each twig becomes whimsical amidst white space, referencing the larger form of the tree from which it came, and the time and distance between its source and the sanctioned white frame. Stephen Antonakos, “Last Collage,” 2001-2002. 50 framed units. Wood twigs, coins and pencil on paper, 4′ x 12′. Courtesy of Stephen Antonakos Studio. Photo by Brian Buckley. To really understand Antonakos’s ability to use these elements as an analogue to our lived experience, it’s important to mention a completely different, site-specific piece: The Search. Designed at the invitation of the Aeschyleia Festival in Greece, it was installed in an abandoned olive oil factory in Elefsina, Greece, and open only at twilight. Thirty-four neon sculptures were placed in seven different parts of the building. What viewers saw were subtle shapes of neon that traced window frames, lit dark corners, and punctuated open spaces. These lights designated a path to follow (or not) in the haze of twilight, inhibiting narrative. In this regard The Search enhances our aloneness so that we may feel less alone. In this aloneness, we observe light gently subsumed by dark, or perhaps is it dark that is overcome with light. Though alone, we observe the trace of someone else: someone who was once here to create these objects, and someone who will return to dissemble them. Still further, we observe that which we cannot articulate, but can only feel. Do we find, as Robert Lax wrote, that “light begets light” just as “dark begets dark?” The Search is thus deeply ontological. It implores us to search for meaning by relying on our powers of observation as we walk through the space. In all these works, we see Antonakos’s uncanny ability to evoke the personal through the use of incomplete geometries, color, and space. These three very different works show how the use of spare material—found or fabricated—searches out sensations that are difficult to articulate but essential to our experience of living: the boundaries we perceive between line and shape, light and dark, object and non-object articulate experiences of interior consciousness expressed in the outside world.